When it comes to marketing, both online and offline, the goal for most companies is usually similar: Get your products seen by as many people as possible and make as many sales as you can. But how can you be sure that your campaign is helping you to achieve this goal? Lots of businesses give up on advertising because they haven’t seen instant results, so they think it’s a waste of time. However, they are forgetting about an important concept which is shaping the future of SEO and marketing. This is something which people refer to as ‘effective frequency’. Why is Effective Frequency So Important? There are many reasons why effective frequency is so important into your processes. We used to solely rank successfully in high ticket niches with quality content and backlinks. However, nowadays our business mindset shift has moved towards technical SEO, engagement, and traffic. Engagement and traffic are what I believe to be the holy grail and will be for years to come. These strategies I believe seen significant jumps because of the CTR, engagement, and traffic they drove to my site. It’s a term you will hear widely in traditional advertising to describe how much exposure is needed for products during an ad campaign. The effective frequency is the number of times a consumer needs to see or hear an advert before they take action and the marketer gets the response they want. Depending on what is the company is selling, this could be anything such as purchasing a product, understanding a message or acting on an instruction. These principles are based on research which suggests that a repeated message is much more effective than one that someone only sees once. So if you’re running a marketing campaign to sell your product, let’s say it’s a hair straightener, your adverts need to run for a good amount of time and you should display them through different media. The aim is to make sure that consumers see your hair straightener multiple times from different sources, and that this repeats the message to them. It’s very rare that someone will buy a product after the first time they have seen it. This is why it’s so important to make sure your brand is seen frequently if you want to really influence someone to buy what you’re selling. Not only does this repeatedly expose the consumer to your products, it also helps to build trust in your brand. People associate familiarity with trust, and if they see your company in lots of places and become familiar with it, they’re more likely to trust you and believe in what you have to offer. Some of the most successful brands have ad campaigns which run for months and even years, making them hugely recognizable to consumers. When I share this information with you then it is because I get amazing feedback from the biggest players in the world killing it in various verticals. 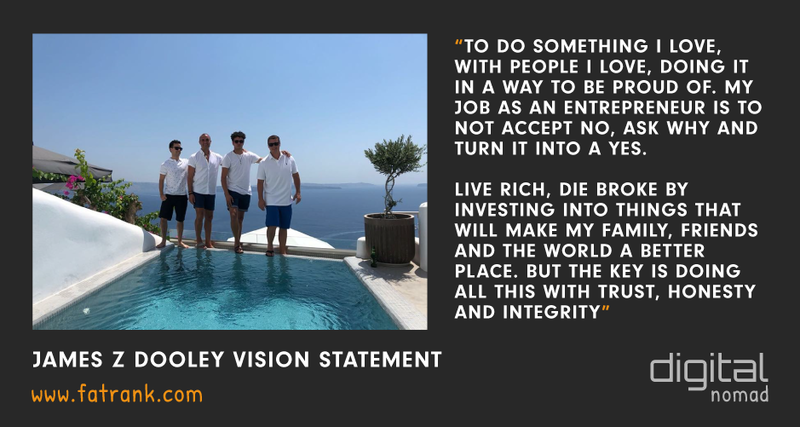 My vision statement has been added to the image which was of the four amigos in Greece while attending Jason Karpouzis wedding. In order to have a successful advertising strategy, you need to be targeting both offline and online media. The two work hand in hand and one will usually offer better results if you combine it with the other. Many consumers now find things they want to buy through entering a Google search. But how do people know what they’re looking for if a product or brand hasn’t been presented to them in the first place? This is where you need to find a balance, and make sure you are thinking about effective frequency for both sides of your marketing campaign. Traditional marketing or offline advertising can take all sorts of forms. These include TV and radio adverts, billboards, newspaper ads, posters, and prints. These are essential if you are launching a new product or company which no one knows anything about yet. This type of advertising is about putting your brand in front of people who would otherwise never have known about it. Going back to the hair straightener example, imagine you are starting the company and your brand is ‘Sandra’s Hair Straighteners’. Is anyone going to be looking to buy a product from you if they don’t even know the company exists? Definitely not. You need traditional marketing to present your products to people who hadn’t heard of them and didn’t even know about them. This is where the TV ads, billboards, magazines, posters etc are vital in gaining exposure for your brand. When thinking about offline advertising, you may want to set up a number of different campaigns. This can improve the likelihood of someone buying your products or services. It is a good idea to invest in different platforms. By doing this that your potential clients will be more likely to take notice of your company or brand. Studies suggest that if a person hears about a product or service through different types of platforms (e.g. hears it on the radio, sees in a newspaper and watches it on TV) they will be more likely to inquire. So you’ve run your ad campaign, and people are seeing Sandra’s Hair Straighteners everywhere. It reaches the effective frequency and someone decides they want to buy one of your hair straighteners, so they take to Google. This person has seen your brand name in adverts, so they type ‘Sandra’s Hair Straighteners’ into the search engine. You need to make sure that your website is ranking in the top SERP position for that key phrase. Do this by running SEO, digital marketing, and online strategies. It’s important that once people know about your brand and want to search for it, they can find you online. This kind of marketing should combine a whole range of things including on-page content optimization, social media promotions and managing your link building methods. The reason a combination of methods is good for your business is it reinforces the idea of effective frequency. We recommend you optimize your page organically through content and link building as well as PPC methods. You will want to be at the top of the pay per click search results as well as the organic results. If you do this your audience will see your website twice. This will then increase trust and make them more likely to visit your website. Social advertising is also a great way to bring clients in, as you can target them specifically. 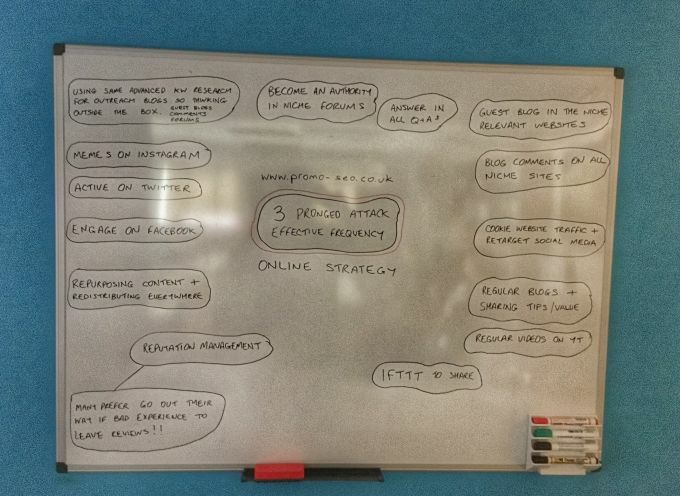 You can also retarget your audience through online strategies. This is great for effective frequency since your audience will see your brand over and over again. You should consider effective frequency along with internet marketing as well in order to build an online presence for your brand. Again, it’s about presenting your products in as many places as possible. You can definitely do this by working with other people. Check out blogs which are relevant to your niche and reach out to them. You could ask if you can write an article on their site. Maybe you find a popular blog talking about hair styling tips, and you ask if you can write a post about Sandra’s Hair Straighteners. This gets your brand in front of their readers, therefore expanding your audience and bringing in more potential sales. A common mistake that people make when building their brand is seeing similar companies as competition. This negative outlook can lose you a lot of opportunities. It also won’t exactly show your company in a good light. Yes, these other businesses may be ‘competing’ for sales from the same target audience as you, but by working together you could see a lot more benefits than working alone. As we mentioned before, you could reach out to other companies. Offer to share their products with your audience on your website or social media. They could then return the favour and share your products with their audience. This could be done by linking to your website from theirs, and if their website ranks well for your keywords it probably gets a lot of traffic. So if you have a link on one of their pages it’s likely to pass traffic through to your website. These links are much more powerful than dormant links from PBNs or spammy sites which don’t get any clicks. If you have a blog which you regularly update with new posts and content, people will want to share it and find out more about your brand. By doing this, you’re creating a win-win situation where you both benefit. If you saw that company just as a competitor, neither of you would gain anything. When you have a relationship with another company, you could set up an agreement to share clients and enquiries. This means your company, Sandra’s Hair Straighteners, could team up with a business who supply salon standard hair dryers. You could then create a website with written content and pages talking about these hair dryers. Although you don’t actually supply these products, you can still rank the website for these keywords. Then just pass those customers onto the other company. This is particularly helpful if you can target people who are searching because they are looking to actually buy these products. But how does that benefit you? Well, the other company can do the same thing and pass people looking for hair straighteners onto you. So you’re both getting more traffic and people viewing your products. These will then hopefully be converted into more sales, so again it’s a win-win situation as you’re both getting things that you wouldn’t have had without the help of the other person. To find out more about this kind of joint strategy, check out this post which explains it in more detail. So what are some of the main points we can take from this article? Effective frequency describes how much exposure to an advert a consumer needs before taking action. Repeated exposure to a marketing message is far more likely to provoke a response than a single exposure. Combine traditional marketing and SEO strategies to achieve the best results from ad campaigns. Working with other companies in your niche will benefit you a lot more than seeing everyone as competition. If you’re looking to grow your brand and promote your products, you need to be considering the idea of effective frequency as the future of online marketing. Implementing online strategies alone won’t get you the best possible results, especially if you’re a new company. Think outside the box and get an ad campaign running with different types of media. Do this over a broad length of time if you want to maximise your return on investment. If you enjoyed this post please feel to share it with your friends. Also, leave us a comment to let us know what you thought. Thanks! 1 Why is Effective Frequency So Important? 2 What is Effective Frequency? Great read, will definitely take these techniques on board and use them going forward. Thats great to hear Phil. Keep me posted on your success stories!! If I was running a marketing campaign, there are a few great methods that I would use to ensure that people are targeted and see my advert multiple times. Retargeting is crucial in advertising and statistics show that many clicks and engagement come through the second or even third time that someone sees your campaign. There are several different methods of advertising but to make sure they see your campaign enough times I would use retargeting through cookies. This way I can ensure that the people who are interested in my product or service are retargeted and this will likely be the best way of increasing traffic and sales as they are guaranteed to be interested. I’m sure you will understand how this feels after being retargeted yourself on a platform such as Facebook. Say if you have been looking at a certain brand of shoes, the shoes will then magically reappear on the side of your Facebook feed, leading you to click on the ad. In terms of other promotion, I would ensure that I build strong articles surrounding my product or service and promote these on social media and blogging platforms. I would also use keyword research to target the best search results for my product which would help it rank on Google for higher traffic results and this keyword research would also help with paid advertisement including social and organic ads which would further benefit my marketing campaign. Retargeting is a huge part of marketing and always will be! Traditional marketing always say it is the third time before any buys a product they see on billboards, tv ads, radio adverts and this method needs to be adapted online. Try and get yourself seen in the serps and also on social media platforms. Given the chance to run a marketing campaign, I would firstly explore the target market chosen for the product. For instance, lets use a toy robot for an example. With the product being a toy, I know that my target audience would be based around children. I could be more specific and decide that the toy robot is for boys aged 12-16. By being more specific, it narrows down the target audience and means the marketing campaign created is a lot more specific. The key thing to remember is that traditional marketing is still vital. So billboard posters near toy shops, adverts on children’s TV channels and radio adverts on family friendly stations. By doing this, my target audience will be able to see the adverts more frequently as I am putting them on platforms in which they may engage with daily. If I was to put them on some sort of horror channel, chances are that a lot of children will not see the advert. In combination with online marketing, we can truly harness the power of effective frequency. Many children this age use social media platforms meaning I could benefit from the targeting adverts that Facebook and other social media websites use. This means that children (or parents) who may have been looking for toy robots will see adverts on their Facebook page about the product. Not only this but by creating adverts on certain child friendly websites and/or running a promotional campaign through a family friendly game (giving them an exclusive item on the game If they purchase the real life robot), children will be constantly barraged with the same product through many different mediums. This is how effective frequency would take place and eventually the child may end up remembering the product and showing it to their parents. I really think effective frequency is so important and always will be! If i was running a marketing campaign I would use many methods to ensure my advertising was seen by as many people as possible. Firstly I would pick out my target audience and ensure that the product and the way I market it is appealing and makes sense to the them. For example if i was advertising a football top I would probably make sure the advert was inbetween a football match interval and the football top is aimed at the suitable fans. I would also ensure I advertise on social media and use it to my advantage as it is free and can reach pretty much anybody across the world. If i want to make sure my product is being shown everywhere then i need to be sure to plaster it in as many places as possible and this shall be done. From adverts, online, newspapers and even word of mouth. After reading this article, I have gained more knowledge in this area. It’s clear how important advertising is for a company in the digital world and in the normal world. If I was running a marketing campaign the first thing I would do is is find my target audience, you could do this by doing online surveys and also try to promote the product the best I could. I would start by adverting the product on social media. From my photography and Graphic Design course at college, I have gained skills and knowledge in this area, so making i would use my skills to make sure the product has a good picture and good a good layout explaining all of the product. I would try to make the campaign simple but effective, if for example the product is advertised on a billboard, people would not have long to read what the product is about. Another important thing is to market the product in my different ways, just marketing in one way means the only certain people will see it, adverting the product on more platforms means more people will see the campaign, meaning more selling of the product. I think advertising now, it would to better to advertise online as more people on online, more people are using the internet, than watching TV. Depending on the product, I think also depends on when it should be advertised. For example, if the product is for children, it would probably be best to run the campaign during the summer holidays or near Christmas. Before creating a marketing campaign you need to see what is trending, what is popular. But also you want your campaign to stand out from the crowd, you want people to listen and remember the product you are going to sell. As a company ‘competing’ with others in a results based industry you have to push your brand to stretch as far as it possibly can and in a more literal sense anything similar to your brand online has to feature either your name or a URL to a website. You have to get your name in as many peoples mouths as possible and this is where synergising as a concept can be so effective. If you can get Sandra’s hair product in the hands of one Youtube’s most popular hair stylists then that generates maximum growth and awareness for your company. It’s being a good middle man again ie. knowing where your product exists best to promote what your company stands for or the product itself. I believe this is where marketing is open to such a vast, unique spectrum of interpretation. It allows you to create your own version if-you-will of how and where that product should be to make the most money. I feel like however one of the topics in which the article glosses over is the time and patience to implement these ideas. I understand that it might not work straight away but being precise in when you pull your ads and start a fresh or keep your campaign going to extend the credence it’s already created is crucial to the success. One way you could make sure that your target audience has seen your advertising is making sure that depending on your target market you advertise in ways they would see/hear it on a regular basis. An example of this would be if the target market in Young adults/ Teens then you advertise on popular social media such as Instagram or snapchat however this would not be appropriate if the target market was adults in their 40’s-60’s who use older social media such as Facebook or WhatsApp and maybe don’t even watch YouTube so have the ad on TV commercials or on the radio would be more appropriate. Another way could be to expand your advertising into other competitors so that they learn about your company and go learn about it. The first video explained this well by saying the artist Kendrick Lamar to gain popularity by being featured in loads of popular artist’s songs and always made himself compete with the main artist so the viewers would have the mind-set of “Oh, who’s this? This seems good. Let’s have a look what he’s done.” This would mean you are getting the same market as other similar competitors and increasing traffic and maybe customers if they enjoy the product or service. 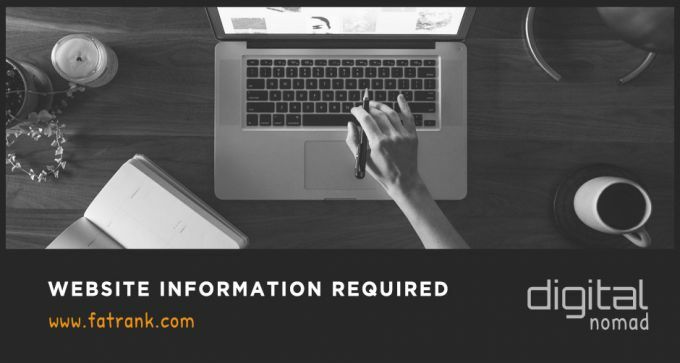 Finally, this one is a bit blunt however you could simply email previous buyers or potential buys and ask them have they seen their most recent ads to get feedback if not ask them how they normally receive ads and target that market. With this option a large sample of people would have to be targeted as that will deliver a wide range of new ways with evidence that more people will see the new advertisement. So true. 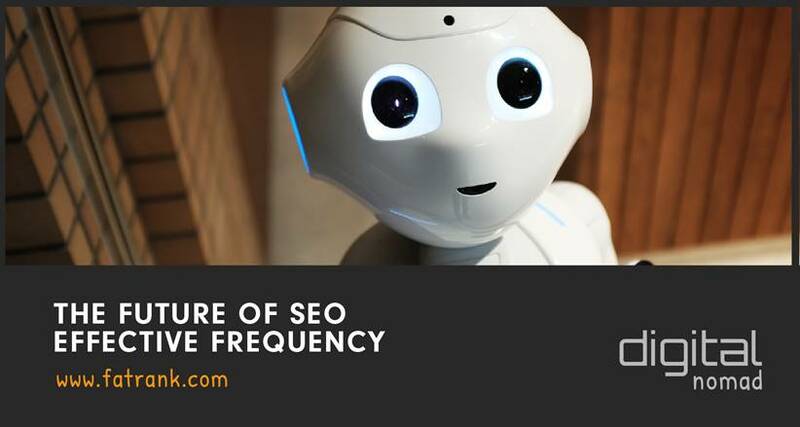 I always have love stuff on “the future of SEO” etc. Voice search is so likely to expand given people are completely engaged with various devices and need to save time. I like using podcast transcripts to add Q/A content and look forward to hearing more from you guys on this. Do you get them transcribed and if so where?